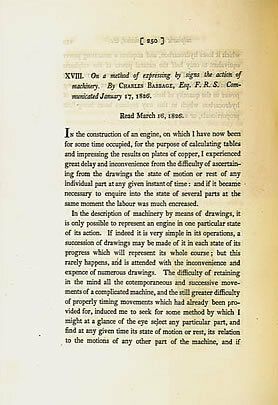 "On a Method of Expressing by Signs the Action of Machinery." Philosophical Transactions of the Royal Society of London. 1826. 116, pt. 3: 250-65. Charles Babbage is credited with laying the foundation for modern computing machines. He designed an analytical engine that was to be capable of performing sequential mathematical operations based on programming contained in punch cards. This is the first appearance of this work.